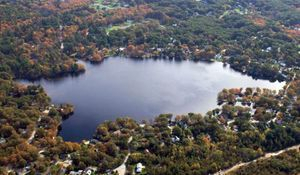 is a small PRIVATE lake (approximately 70 acres) that is partly in Bellingham and partly in Blackstone, MA. This quiet, serene lake is privately owned. The residents here enjoy the beauty of the changing seasons that only lake living can deliver. Access to fishing, boating, swimming, skating, and more are available. Also, fishing is on a catch and release basis so that our fish population remains healthy does not dwindle. This lake is home to many beautiful wildlife including swans, ducks, blue herrings and more. In fact, our resident swans have been with us for more than 10 years! The Lake Hiawatha Association is run by volunteers who help to make the lake safe and enjoyable for all residents. Membership is $75.00 per year. This fee helps support the annual de-weeding of the lake as well as other beautification and environmental friendly projects throughout the year. We encourage all residents to join. We meet monthly during the months of April through October. All are welcome to attend. Lake Hiawatha is truly a hidden gem in the Bellingham - Blackstone Area. Just a sampling of the beautiful sights on our lake. The meeting includes a special, hour-long "Birds of the Lake" presentation by Bellingham residents Frank McMahon & Leslie Glover that will begin at 6:45 PM. The presentation showcases birds around the lake, including facts and lore. so we can plan accordingly. The LHA Annual Dues Bill for 2018 has been posted on your mailbox. Please remit payment as soon as possible. Need a copy of the 2018 Dues Bill? Read our past meeting notes here. Boat Massachusetts: Your Guide to Boating Laws and Responsibilities. To learn more about what the Lake Hiawatha Association is Click here. 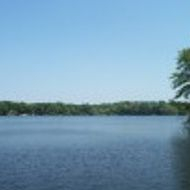 Becoming a member of Lake Hiawatha allows you to use the beach for swimming and boating as well as access to the boat launch off Marcel Lane. Since this is a private lake, our volunteer Lake Wardens monitor the lake. Note: This is a voluntary position and lake wardens are NOT available on any particular schedule. Please be patient.